This text is oriented towards advanced industrial engineering students and MBA programmes that have a course focusing on production. 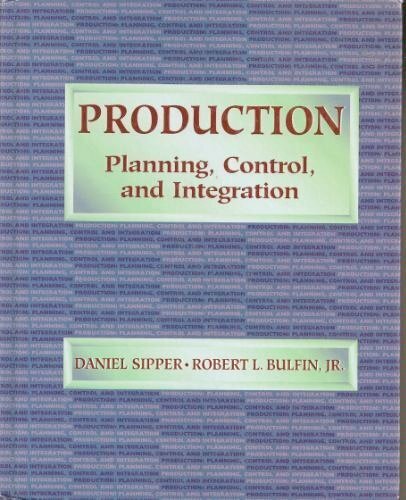 Included in the coverage is the evolution of production systems, problem solving, forecasting, aggregate planning, inventory, materials requirements planning, scheduling, project management and integrated production planning and control. More than 100 examples and illustrations. Over 150 figures enhance discussion. The math is introduced gradually and presented at the proper level, assuming students are familiar with basic statistics and operations research. Illustrative examples begin each section, followed by a discussion of the theories and techniques. Theoretically exact, but application-oriented approach is in tune with modern problems and developments. Boxes highlight implementation and practice of the concepts. Vast content allows this text to be used as a future reference.